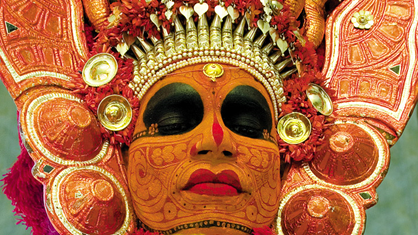 “Theyyam” is a popular ritual art form of worship of North Malabar in Kerala, India. The Theyyam dance is performed in front of the village shrine and in the houses as ancestor worship. The Theyyam period is typically from the month November and comes to a close by the end of May/June. Theyyam’s origins are said to be from the ancient art form of Kaliyattam. 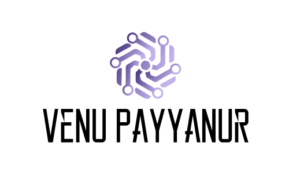 It is said that Parasurama, the sixth incarnation of Lord Vishnu and the founder of the State, sanctioned festivals like Kaliyattam, Puravela and Daivattam or Theyyattam to the northern citizens of the State. An ancient ritualistic Kerala dance form that elevates members of the lower castes to the stature of God. The responsibility and culture of Theyyam was given to the indigenous tribal communities and from here the great stories, heroes and worship of celestial beings began. Man assumes the form of God and dances propitiating and appeasing them and in return, the Gods assure prosperity and peace to society and is the belief behind the Theyyam performance. Breaking from traditional roles, Theyyam performers are from the lower castes of Hindu society. The performers of Theyyam belong to communities like Vannan, Malayan, Mavilan, Velan, Munnoottan, Anjunnoottan, Pulayar, Kopalar and others. They might be from the lower caste, but the moment the performer transforms into the deity, he becomes divine. It is believed that at this point, the performers are no longer men, but have transformed into Gods and the crowds are eager to seek their blessings. In those days when untouchability was prevalent, when they performed Theyyam, they could be touched. People would fall at their feet and seek their blessings. Even high caste Namboodiri brahmins and Nairs fall at their feet, seek solutions for their personal and family problems and blessing. And the moment he takes the costume off, he becomes an untouchable again. The transformation from an untouchable to God and then back to an untouchable in few hours is amazing and to be seen to be believed. Belonging to North Malabar and have seen Theyyam performance throughout my life, I never realized the greatest life lessons one can learn from the above ritual. Theyyam artists are willing to go through extreme hardships to learn and perform this art form, at times at great risks to their life as they have to run through burning embers, just to transform themselves to the position of GOD where all and sundry seek their blessings, even if it is for a short duration. From an everyday life of poverty, hunger and neglect when others treat them as untouchables, for few hours they become GOD and others prostrate before them. That power and authority, even though momentary, is worth pursuing and enjoying. Power and authority are separate but related concepts. A citizen’s interaction with a police officer is a good example of how people react to authority in everyday life. For instance, a person who sees the flashing red and blue lights of a police car in his rear-view mirror usually pulls to the side of the road without hesitation. If you have ever approached senior police officers, bureaucrats and other government officials, you would know how they treat you in their offices. A manager in an organization has authority if he or she has the right to direct the activities of others and expect them to respond with appropriate actions to attain organizational purposes. Authority most often comes from the duties and responsibilities delegated to a position holder in a bureaucratic structure. A company president can order a product design change, for instance, or a police officer has the authority to arrest an offender of the law. Imagine the life of power, authority and perks being enjoyed by Ministers when in office and what happens to them when they demit their office. So is the case with senior Executives of large corporations. When in office, they are like God for those who are depended on him for their survival and growth. You will approach him for solutions, help when in need, or seek his blessings just to please him. But what happens to them when they demit office? Do you respect/fear a retired police officer or a senior executive? Leaving a top position can be tough. Your diary clears, your retinue of staff vaporises. Suddenly, no one is listening to you anymore. Ego, hubris, whatever you call it, as we rise to positions of power, we too often come to “believe our own hype”. You make a lot of money and you have a lot of influence over many things. The inevitable fall can be bruising. While at work, you feel valued and competent; at home, you are in your wife’s world, discussing what to cook for lunch and when to pay the utilities bills. You may feel that you are wasting time and not doing anything constructive and your life is worthless. There are many different types of power and authority. Positional power or legitimate power, coercive power, reward power, charismatic power and knowledge power are some of them. All other power dissipates once you demit office, except those with the power of Knowledge. So as to retain your respect and authority, even after demitting office, do not misuse positional power when in office and acquire knowledge power to influence others.